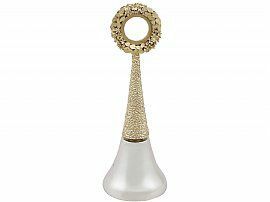 This fine vintage Elizabeth II sterling silver table bell has a conical form. The tapering column has a textured finish and retains the original gilding. The silver gilt loop handle is encircled with impressive pierced and applied foliate decoration in a laurel design, with a plain ring to the centre discreetly inscribed with two cross marks to one side and three to the other; these are property markings and do not detract from the aesthetically pleasing appearance of the piece. 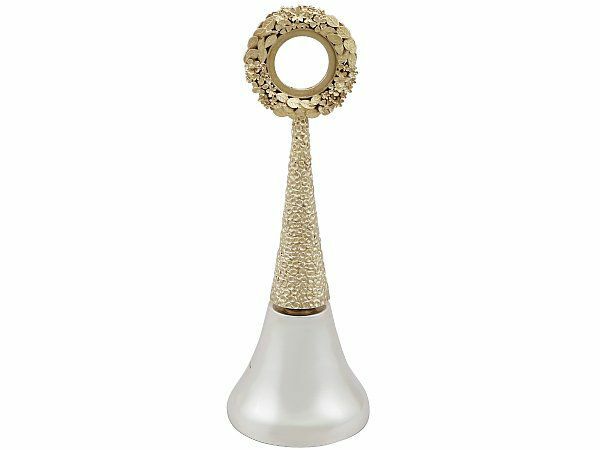 This impressive table bell reflects the iconic style and was crafted by the modern London silversmith Stuart Devlin. This vintage Stuart Devlin silver bell is a very good gauge of silver, fine quality and in exceptional presentation condition.